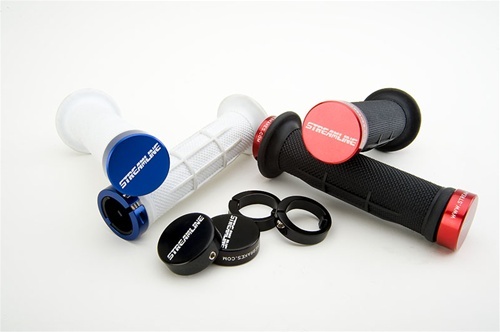 These half waffle grips are perfect for the rider who wants true feel and feedback from their grips. The pinch bolt means you no longer have to worry about your grips slipping, and the stylish Blue, Red or Black anodized finish on White or Black rubber adds the pro look too. 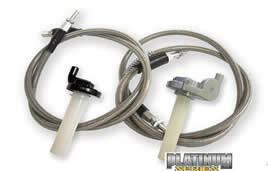 Streamline "Platinum Series" throttle kits. If you prefer to ride with a twist rather than thumb these kits are ideal. All cables are teflon lined s/s braided hose and s/s inner and are 2" longer than std. Avial for most popular models. 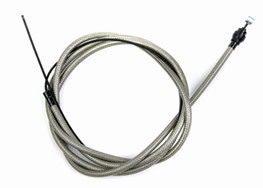 Whether its twist cable, thumb cable or clutch cable Streamline offer +2" longer than std so you can lift you bars easily. All cables are teflon lined s/s braided hose and s/s inner. UV protected pvc clear coating saves any wear on bodywork.